The greatest short films from Finland and abroad. Animated short films for kids. The screening is mostly for school groups and the ticket office is not open at Bio Rex in the screening on September 27th at 9:30. Eight Films nominated in 2018 in the British Short Film and British Short Animation categories at the EE British Academy Film Awards. Special screening honouring the 100th anniversary of Ingmar Bergman. Bergman Revisited is a compilation of six very different films, spanning from Bergmanesque drama to animated critical satire. All in all, inspired by the mind of Ingmar Bergman. Recently made short films by students of the Baltic Film, Media, Arts and Communication School in Tallinn. Free entry. On the crossroads of life. Filmmakers we’ll be hearing about! Short films directed and starred by Bahar Pars. Total running time approximately 75 minutes. Bahar Pars will be present at the screening. Kiss Me Quick, I’m Irish! Fresh short films from Ireland. Did you fall in love with Titanic as a teenager? Were you a survivor of one of the world’s biggest emotional shipwrecks? Hannaleena Hauru (Thick Lashes of Lauri Mäntyvaara, Love & Anarchy 2017) watched the James Cameron blockbuster for the first time since her teens, and realized all her past relationships have followed a romantic pattern learned from Titanic. Rose (Hauru) and Billy Zane (Kimi Vilkkula) have a plan: move to a picturesque neighbourhood, get a dog, and get pregnant. However, a middle-class hetero romance isn’t that simple. Stressed-out Rose meets the bohemian Jack (Jussi Lankoski) and lets loose. Is Jack Rose’s Leonardo DiCaprio or just an iceberg? A metafilm filled with pop cultural references, Metatitanic deconstructs the performative essence of romantic love. Translation: Arttu Manninen The short film JUCK(THRUST) is screened before the main film. 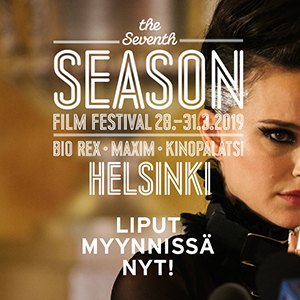 Night Visions International Film Festival is the biggest, the oldest and the most prestigious film festival in Finland focusing on – but not limited to – fantasy, horror, science fiction and action cinema. The festival is arranged twice a year in Helsinki. Fresh shorts from Iceland, Norway and Sweden. Fathers and daughters, lovers and mistresses. Super16 is the leading independent film school of Denmark. It is run as an association by the students themselves over a 3-year course. Every two years, the residing members of Super16 admits 6 directors, 6 producers and 4 screenwriters to continue the school. Super16 focuses on developing the talent mass of the Danish film industry through theoretical teaching and practical work, with a priority of keeping the process free of restrictions and creative limitations. This screening of six films features their most recent productions. Turku Animated Film Festival is a new international film festival celebrating creativity and the art of animation. TAFF – Fresh from Finland presents a selection of new Finnish animation.